So I recently moved into a graduate dorm at my school, where we have apartments that have kitchens in them, yay! It's been great being able to cook and bake, I really enjoy trying new ideas with my boyfriend and coming up with random dinners based on whatever ingredients I have on hand. The only downside to my dorm is that it's a bit far from grocery stores, so it's quite often that there are no vegetables available for dinner. I love stir frying fresh Shanghai noodles with meat and vegetables. 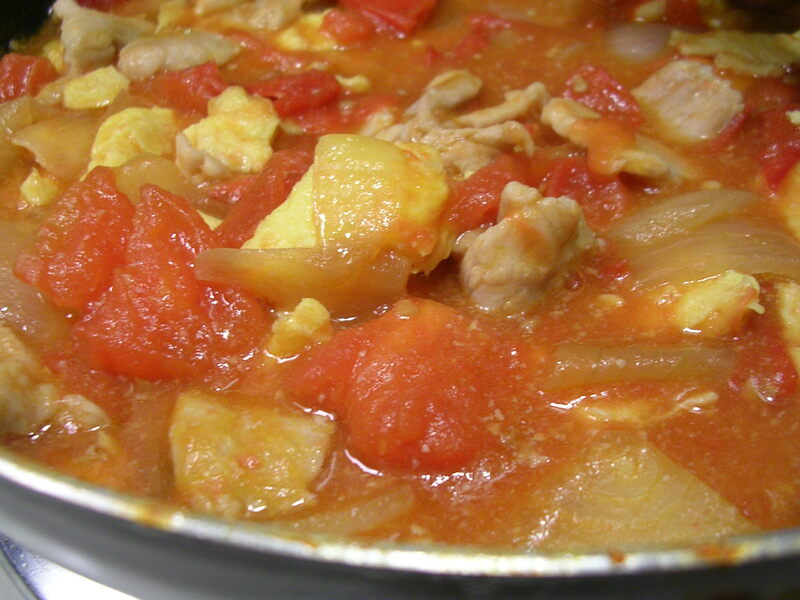 It makes a delicious dinner whose texture is both unique and satisfying, very unlike rice or saucy dishes. Stir frying fresh noodles makes them chewy with an al-dente feel, which you can't get from just boiling fresh Chinese noodles, and if you cook it with soy sauce and/or teriyaki sauce like I do, they have a lot of great flavor because fresh noodles really soak up flavor unlike dried noodles and lo mein that need lots of sauce or soup. My boyfriend and I made these noodles above one night, experimenting as we went along because we didn't know how to make it. Fresh Shanghai style noodles can be purchased at Asian markets in the refrigerated section, they are sealed in packages and last a few weeks if kept cold. We first sauteed the noodles in a medium hot pan with some oil, until the noodles began to look less flour-y, more opaque, and were slightly toasted in some areas. Next we added small amounts of water (1/4 -1/2 cup) at a time and closing the lid of the saucepan, letting the water cook off to steam the noodles a bit, allowing them to cook. We continued this until the noodles were somewhat chewy but not raw anymore in the centers. 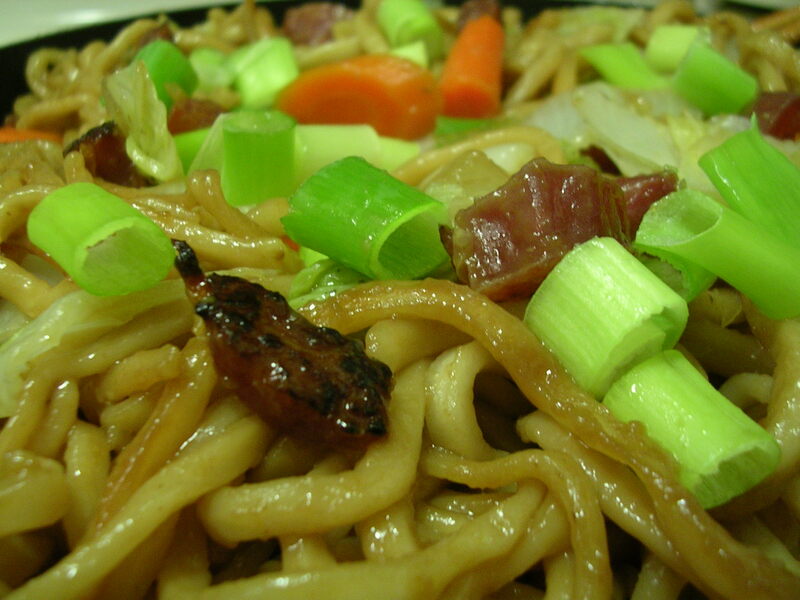 Then we threw in some soy sauce and teriyaki sauce, letting it soak into the noodles, before tossing in vegetables that we had pre-sauteed on the side, including onions, carrots, and some napa, as well as some nicely seared diced Chinese sausage. Freshly chopped scallions on top for garnish, and voila dinner was ready, and boy it was yummy. Soft with a slight chew, the noodles were wonderfully flavored without excess grease or sauces. And the Chinese sausage really added extra flavor to spruce up the entire dish. I've gotten the tomato egg and beef dish from Quan's Kitchen for Chinese takeout quite a few times, but that's simply because I grew up with my family's homemade tomato and egg dish (no meat). It's tart but is subdued by some saltiness which makes it a great dinner dish in my opinion. I get tired of straight up salty dishes sometimes. It's funny, because my mom cooks tomato and eggs very differently from my grandmother, who also cooks it very differently from my grandfather. It seems that the way in which the egg is added to the dish is very crucial in determining the final style. I certainly enjoyed all the different styles made in my family, but the kind my mom makes is still my favorite, which has chunks of eggs in it, instead of the other types that have very mushy egg bits. To make it with egg chunks, I first beat up a few eggs, adding a dash of white pepper, salt, sugar, and a little bit of rice wine. 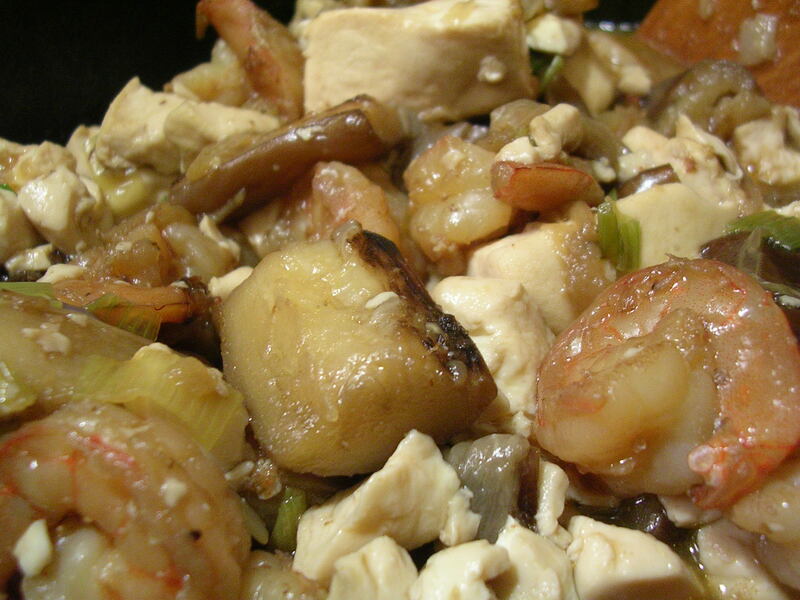 These flavoring ingredients serve to give the egg itself flavor (as it will not absorb flavor from the sauce of the dish), as well as to rid the egg of what the Chinese call a "fishiness" found in eggs, meats, and fish. I saute the eggs on medium heat, almost like I do with scrambled eggs, cutting it up into chunks just before they're done. I undercook them because they'll cook more when I recombine it with the rest of the dish. Next I sweat some chopped onions in a pan, before adding tomato chunks, then I add a little bit of water and let the tomatoes cook down. They release a good deal of water on their own, especially if you throw in some salt early on (you'll need it for the flavor anyway later). Then it's all about adjusting the flavor of the sauce (which is just water and tomato juice) by adding salt and sugar, and maybe just a dash of soy for a kick. Add back the eggs, and if you're using meat, have that pre-sauteed on the side (marinated first with salt, sugar, rice wine, white pepper, and corn starch… I always marinate meats like this, it makes it tender and flavorful). The final result you see above, and it had a lot of yummy sauce and the flavors of everything came together to make it a delicious dish to go with rice. I love love teriyaki salmon, and I was thrilled when my mom visited me and brought a bag of frozen, individually packaged salmon fillets, perfect for a meal when I'm stuck for ideas. I thaw out my salmon, and marinate it for about 30 minutes in a teriyaki sauce made with 2 parts soy sauce to 1 part honey, then I add a little bit of white sugar, garlic powder, onion powder, and sesame oil or vegetable oil, all mixed together until incorporated. After marinating, I place the fillet along with the marinade in a foil-lined small round pan, and bake at 400 degrees F for about 15 minutes or until the fish flakes easily. I baste a few times in between with the marinade in the pan, and after the salmon is done, I pour out the leftover marinade and refrigerate it for next time. The sauce doesn't seem to reduce too quickly, so I can keep reusing it (since it's been cooked in the oven it's safe) for future salmon fillets. You can also just make a small jar of the teriyaki sauce to have on hand whenever you want a quick dinner. 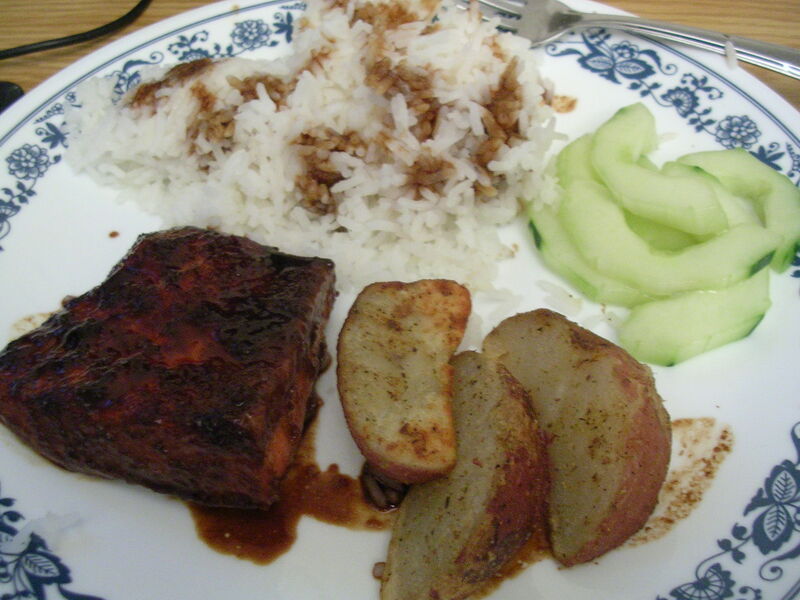 I paired the salmon with some white rice, some cucumber salad my boyfriend made (mix fresh cucumbers with white vinegar, sugar, salt, and sesame oil), and some pre-prepared potato wedges that were baked in the oven along with my salmon. I also had it once with zucchini on the side too. Yum. Okay, this lunch is highly unhealthy, but seriously tasty. You can buy frozen unagi (bbq eel) from Asian markets in large boned fillets, and they are pre-cooked, so you just have to reheat them in the microwave or on the stove/in the oven to get the unagi nice and juicy. What can I say, we were out of veggies that day and desperate for a quick lunch. My boyfriend fried up an egg for each of us, and I requested sunny side up, which came out quite nicely. 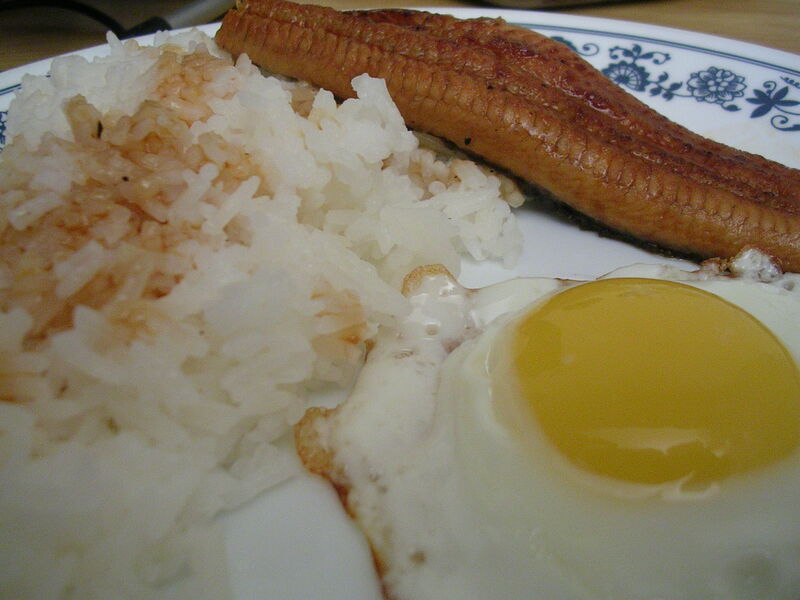 I drizzled some of that delicious unagi bbq sauce onto my rice, and that's lunch! Unagi is so yummy with rice, and it only costs about $3 for a 6 oz. fillet, so it's ultra cheap compared to the prices you pay for unagi dons and sushi rolls at Japanese restaurants. This entry was posted on Saturday, September 15th, 2007 at 6:57 am	and posted in Chinese, cooking, Uncategorized. You can follow any responses to this entry through the RSS 2.0 feed.